dinnerstick wrote: hey pig, question- (two questions) do you use a standard bathroom extractor, will that handle all the water vapor ok? or do you need a special / kitchen version (see how little i know about extractor fans...)? and, do you have a valve or opening on the trap (low point) of your flexi hose? or do you just drain it after the brew session? Hi, although not the best picture, here it is ready for use. What isn't shown here is that the flexi hose is a little longer that the one in this shot and when it gets hot from the steam it sags which creates a low point to collect the condensed water. A typical 1 hr boil creates 500 - 700 ml of condensed water which I drain into a jug after the brew session. I'll try and take a 'mid boil' picture on my next brew day. The fan is a regular bathroom extractor fan, the only thing I've found is that it can create quite a vacuum so I leave the malt pipe stirrup on the top of the BM and then the hood onto that to create some air flow. Last edited by Batz on Sun Feb 02, 2014 11:03 am, edited 1 time in total. thanks swigginpig! very useful info for my new setup. i know black sheep from the bottles they ship all the way down south... very nice. also isn't the wyeast west yorkshire strain from timothy taylors? off topic i know, but i got it in recently. it's still in my fridge, but at some point i'm going to give it a head-to-head with the fullers strain which gets a lot of use in my brewery! I'll try and take a 'mid boil' picture on my next brew day. I even remembered to take a photo , I hope that this picture does a better job of showing you how the trap is formed. Last edited by swiggingpig on Sun Feb 09, 2014 9:32 am, edited 1 time in total. I cut the hole in mine today. The dish is very thin and it was a battle to get the hole cut neatly but I consider I did reasonably well in the end. I don't need to vent mine externally as I brew in my garage and there is plenty of ventilation. I am making a hood purely to see if it increases the boil intensity as I believe a more vigorous boil may produce a clearer beer. I will post some more pics a bit later on when I take some. ok so the hoods are a very expensive funnel and help with steam extraction but is there any difference between the SS and copper hood or is it just the bling factor? SS hoods are a fairly new addition to the Speidel line-up. A few years back when I bought my BM, copper hoods were the only game in town. If I were to purchase the BM again now - I would probably go with SS hood; same functionality at a lower price. paddye wrote: ok so the hoods are a very expensive funnel and help with steam extraction but is there any difference between the SS and copper hood or is it just the bling factor? As cpa4ny said: first there were the copper hoods while the stainless steel ones are only on the market for a few months. Function is the same, looks are different and so is the price tag. 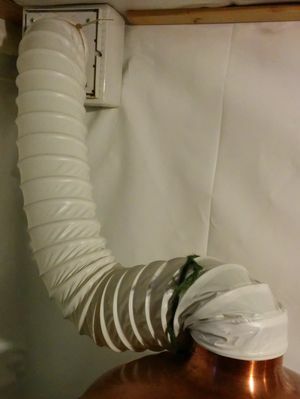 I might be buying a SS hood this year as it will help getting the steam out of my basement (extraction hose through the window). glad I want for the ss version then. I will be buying a SS hood for my Braumeister this month. I hope to do a new brew in the beginning of May so I can test it out. Dicko wrote: I cut the hole in mine today. How did you go with this. Did using the hood to increase the boil intensity produce a clearer beer? Sorry Andy I am working away at the moment. When I get home I will post up some pics. I have only done one brew with it and it worked great, it was an Amber Ale and I got a great boil. My measurements were approx the same loss for the 80 min boil but the boil was more vigorous. I will reserve any more comments until I have tested it over many brews, particularly the light coloured Pils beers. I initially tried it with a 75 mm hole in it and it caused the boil to constantly foam up so then I enlarged the hole to 150mm and that seemed to work great. No rush, I have 101 other projects on the go and no time, so I don't think I'll get to this one for a while. When I returned home from holidays I was glad to discover that my latest brew related order had arrived. I'm now the happy owner of a stainless hood for my Braumeister. Since it completes my BM set-up, I promised my girlfriend that this would be the last accessory for my BM for now. Next brew day will be in about two weeks, so I will report back then.